One of the wrinkles in our client’s non-disclosure petition involved his blood alcohol content. The new DWI sealing law does not allow DWI convictions to be non-disclosed if the person was convicted of having a BAC over 0.15 (Texas Penal Code Section 49.04(d)). Our client’s case involved a BAC over 0.15, but he was not convicted under Section 49.04(d), but rather under 49.04 without any finding of a particular BAC. Our client’s DWI case happened before the legislature added paragraph (d) to the DWI law in 2011. So, as we saw it, our client still qualified for the new sealing law. Having alleged all of the qualifying conditions in our petition, there wasn’t much to the hearing when the time came. The Denton County District Attorney did not oppose our petition and we were able to take the proposed order to the judge without the need for an evidentiary hearing. We were prepared with the offense report, clerk’s records, and criminal history for our client, but none was needed. 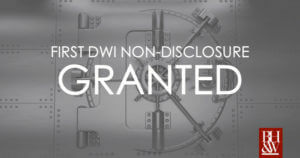 The judge gladly signed the order for non-disclosure and our client became the very first person in Denton County to have his DWI conviction non-disclosed. Our client, who has only had this one encounter with the criminal justice system, was thrilled that this uncharacteristic mistake can finally be put behind him. We look forward to helping more people seal their DWI convictions in both Tarrant and Denton Counties. To see if you might be eligible to have your DWI case sealed, contact our team today at (817) 993-9249. *If you are a Texas attorney and need assistance drafting a petition or order for a DWI non-disclosure, please reach out and we will be glad to help.